You will never find what you want sometimes for any money you can bar. Use FTN95 with OpenGL and write such programs yourself. This is easy. I can send you demo written 20 years ago still with FTN77. can you post us an example picture of what you want to achieve ? See file in this link [url]https://1drv.ms/u/s!AuTT_gAwgmEIhIp_R3CHjfR2JQDeDw[/url] This is a visualization of a 50*25*10 array with the 3rd (z-layer) index as value. This visualization was obtained via exporting a file to Paraview (OS visualisation software, excellent btw). I'd just want to do something basic like this internal in my program so that I can QA before exporting it. Hello - I saw some discussions in this forum on 'Native %pl', which seems partly to go into a direction I could use. However, I could not work out what it exactly is and how to use is. Would appreciate if someone could explain. I also went ahead and dabbleb with plotPL, only to find out that it currently does not jive very well with Ftn95. I saw an old discussion and downloaded a DLL that makes some routines of an older plotPL version work, which is already useful for a quick fix right now. However, does anyone have perhaps an update of the use of plotPL wioth Ftn95?? 1. 'Native' %pl has a 2-D X-Y plotting capability only. So no good for your specific problem. 2. I've never heard of 'plotPL' - do you mean PLPlot ? or if not what ? 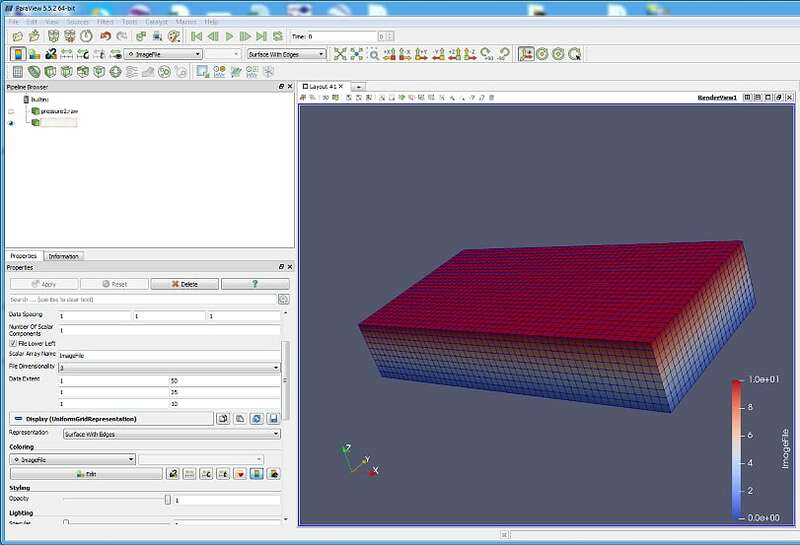 3. with SIMFIT, the capability you want is probably surface plotting. you'd have to arrange the definition of data corresponding to the 3 visible faces of your 'cuboid' as 3 seperate 'surfaces'. For 'cutting' you could do that by limiting the data to be plotted to that within the cut 'cuboid' by interactively specifying a co-ordinate in the 3rd direction to define the plabìne, Then dynamically replotting it. Alternatively you could also directly call your Paraview program from within your ftn95 code and use that directly for your pre-visualisation task. Download the zipped DLL for old PLplot version from https://www.dropbox.com/s/cu2zpjffai99o7j/plpltSal.zip?dl=0 . 3- I have tried some of the simfit routines using a 'slice' or 'layer' of the data cube. I found the options on simfit quite limited though. For example, I used the surd2s routine but was unable to pass x and y vectors for my 2d data array. JCherW: I built and posted the DLLs and examples for PLPlot on 28 March 2017, in the thread http://forums.silverfrost.com/viewtopic.php?t=3469 . The last statement remains true today (October 2018). Gosh I compleely forgot about that 18 months ago post and I started it !!! I remember I was put off pushing it further because of the obvious linux-entric slant to the development community. That and the fact you couldn'0t actually build the ltest version from source because of the need to use CMAKE which wasn't/isn't available in ftn95. A pity. It looks like another of those promising but so near yet so far (as far as ftn95 is concerned) offerings. The ISO_FORTRAN_ENV bits in the Plplot sources are not likely to be essential. It is up to someone to decide that it is worth putting in the effort to back-port the sources to Fortran 95, and do so. But then, why bother? You could build a Plplot DLL using Gfortran and link your FTN95 driver programs to that DLL. You could use %pl to set up the x and y coordinates. Then since %pl is a graphics region you can simply draw your contour lines on the drawing surface via a call back function. I've got this to work, using Paul Bourke's CONREC routine. Basically before the call to %pl, I call CONREC and write all the pen movements to file, then after the %pl frame is drawn, I use the call back to read and draw the pen movements on graphics region. This post is all very interesting. After looking around myself I can't find anything either to do what's really wanted (contours on 3-D cuboid. What's needed is an adapted FE contouting code ! JohnC - over to you maybe ? Ken, your linked code is very interesting, although it only does line contours as it stands doesn't it, not shaded contours. I tracked down the original article and that's even more interesting ! Not for the code but for the ads back in '87 !!! .. .when I was still 6 yrs from using my first PC !!! Have a look I guarantee it'll amuse, thrill and amaze al at the same time !!!! There's another article too in the same issue of BYTE magazine, which has even more amazing hardware ads !!!!! Careful, I guarantee you won't stop looking at those ads once you start ! Oh and don't fall of your seat or spill your kipper tie when you spot the leading portable computers of the era !!! for a 2-D contouring 'stop-gap' option you might be able to use the Simpleplot (that's ye olde %pl (without the '[native]' option) !!!!!! You may, or may not, encounter some of the niggly restrictions seen on 3-d plotting which are not fixable (because SF have only the dll not the source code - this is why they spent so much effort creating native %pl for X-Y plotting, but it's worth a try initially. Thanks to the curve-fitter link. I certainly remember being impressed by the 40-mb disk. We called it the "Compaq luggable". It went well with the brick portable phone. Remember the joys of extended and expanded memory ?